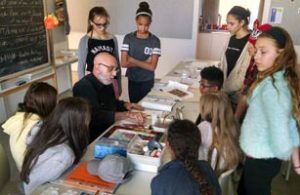 Ralph Iaccarino worked with students from the Creative Arts Academy on watercolor techniques and design. His workshop began by showing an example of a technique, i.e. “blotting,” and then having the students create small works using that technique. Students finished the workshop by creating a larger piece of their choice technique(s) as he and the CAA Visual Arts teacher, Nick DiGoa, observed and assisted. This continues an on-going goal of the CAA to provide students experiences with as many artists as possible illustrating a wide variety of themes, perspectives and media. This project is supported with the Quad City Arts Dollar$ funds, provided by Hubbel-Waterman Foundation, Illinois Arts Council Agency, John Deere, and the Doris and Victor Day Foundation.